Julie's Creative Lifestyle: Returned From Blogging Break! Hello friends! I enjoyed my blogging break so much and I'm looking forward to getting back into to blogging again. I really enjoyed spending time with my family and we even took a vacation to California. I will be sharing about the trip with you soon. This is me just enjoying the California beach! I missed you all and I'm look forward to visiting your blogs and catching up with what is new with you and what you have been creating. I have also decided to take a break for the rest of the summer from my Makeup Monday Series. I will resume this in September. 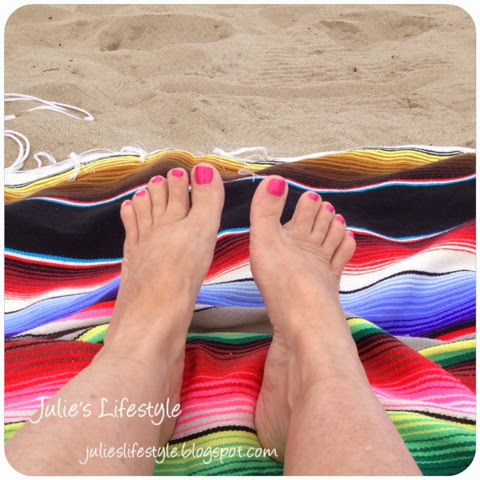 Welcome back, Julie :-) Love your pretty pink toes; thought I was the only one who took a picture of my feet at the beach! I'll be looking forward to your Make-up Mondays. Welcome back, lovely lady! You were dearly missed, my friend :) I can't wait to see pictures of your time away - love this one of your pretty pink toes on the beach. Welcome back. Glad you had a nice vacation. I'd love to visit a beach someday. Welcome back to blogging! Sounds like you had a wonderful time in sunny California, where I'd love to go one day!! Pretty pedi! Have a great week! Enjoy it when you can! Hi Julie, glad to hear that you are spending happy holidays! Lovely to have you back Julie! Your photo is a reminder of those special summer days. My french family leave tomorrow morning for their holiday in the south of France - they are all excited to be at the seaside again! We missed you Julie! I stopped by the other day to see if you were back and almost didn't do so today but something told me to. Hope you had a wonderful vacation. Glad to see you back - looking forward to reading about your adventures. Hi Julie, glad you took some time for yourself, I know how this is, I am still taking a break, no vacation though, but just not hosting my weekly parties for a while. I felt like I was in a revolving door.... Love you pretty pink toes!!! My favorite color. Look forward to what you have to share. So happy to hear you had a wonderful relaxing time by the beach! Welcome back! Happy 4th of July - Drink & Crochet! © Julie's Creative Lifestyle: Returned From Blogging Break!